Mac and Yease: baked in a hot oven, vegan cheese and cream bubbling from the sides baking to a nice crispiness on top and soft melted goodness inside. I absolutely love mac and cheese. Being Italian we were never given mac and cheese. My Dad would say “that stuff is crap, pasta should be made the way we make pasta”. I was always curious though and my first experience with mac and cheese happened when I was in post-secondary studying engineering design. Money was tight and my parents were spending a lot of time at the cabin. Never able to leave well enough alone I would get the packaged mac and cheese and elaborate on it, creating dishes like Thai shrimp mac and cheese, spicy Italian mac and cheese, classic mac and cheese mixed with ketchup, and a favorite of mine, bbq hot dog mac and cheese. 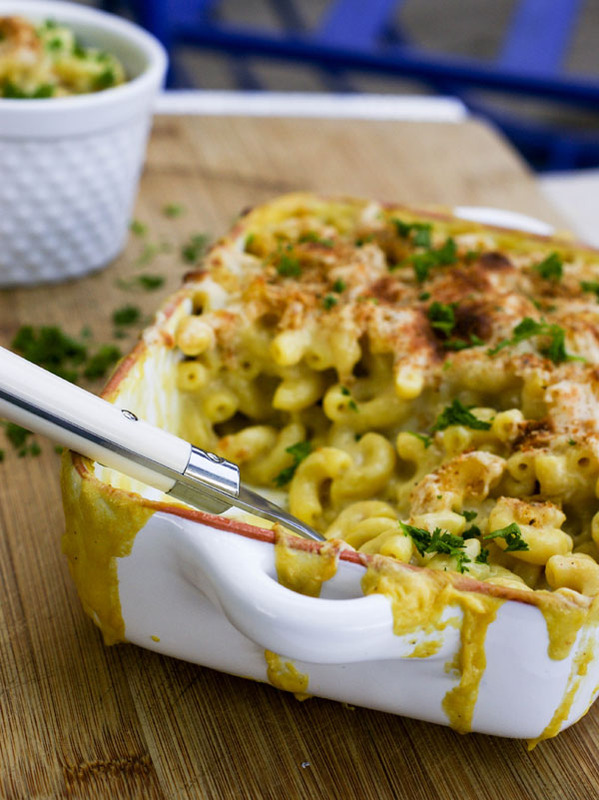 To me, mac and cheese always brings thoughts of home soul cookin’. Fried chicken, collard greens, and three cheese mac and cheese, oozing with creamy cheesy goodness. Tonight’s dish was inspired by a trip to Seattle my wife and I did. We happened upon the old Armory building of the Seattle center which had a food fair with various foods like pizza, fresh gourmet burgers, meat pies, and a great organic café, Plum Pantry, where we read on the specials menu “Mac and Yease”. I said to Nicoletta that it sounded interesting and had my curiosity along with her’s, and since it was vegan Nicoletta was surely in. It was absolutely delicious, scrumptious, out of this world good. It had such flavor that when the bowl was empty we were still trying to scrape the bits of creaminess off the bowl. I could have eaten at least another few bowls but unfortunately, they were closing and cleaning up. So the quest began what was that flavor and what is yease. Back home, after some google searching, we found that when making a vegan mac and cheese the ingredient most used for the “yease” flavour was nutritional yeast. On a trip to Earth’s General Store located in a beautiful culinary pedway on 104th Street and north of Jasper Avenue in Edmonton, we by surprise found the nutritional yeast. Mac and yease here we come. Of course, I saw some vegan Monterrey Jack which I thought would work very well in giving this dish the oozing goodness we love, and the great flavor of unsweetened almond milk helps build the creamy sauce. Blend that with an array of spices like smoky Spanish paprika, onion powder, garlic powder, salt and pepper a little bit of Italian seasoned bread crumbs and some fresh chopped parsley finish this dish with a flavor beyond good. Baked in a hot oven, cheese and cream bubbling from the sides baking to a nice crispiness on top and soft melted goodness inside. A nice nutty backdrop from the almond milk. This is definitely making my mouth water. It was so good I can’t wait to make it again. Don’t be afraid of vegan dishes this one’s a testament to how great they are. I am singing a song that comes to mind as I close off. “Return of the Mack” by Mark Morrison. So so vegan cheesy yeasy good! You gotta eat this! A little update on The Mac: we made it again for a vegan/gluten-free event we catered and we used corn elbow pasta. Even in the gluten-free version, absolutely delicious! In a large pot bring 8 cups of salted water to boil. Taste the water for saltiness. Toss in pasta and cook for 11 minutes. Dust in potato starch and make a rue. When mixture is like a paste add almond milk. Throw in nutritional yeast, onion powder, garlic powder, paprika, salt and pepper, stirring constantly till nice and creamy. Add 1/2 the grated jack cheese. Stir again. Take pasta off heat, drain, and toss into sauce mixture. Mix well till pasta is well coated. Blend in some of the breadcrumbs. Toss mixture into an oven-safe dish. Sprinkle the rest of the breadcrumbs on top. Place the rest of the cheese evenly over the top. Bake in a 400° F preheated oven. Cook until nice and golden brown and crispy on top, approximately 30 minutes. Take out of oven. Sprinkle with fresh chopped parsley. 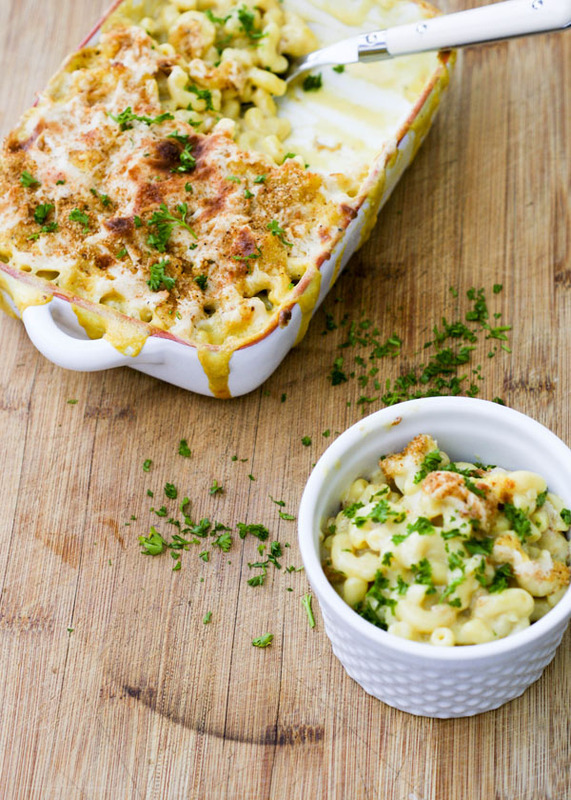 Mac & cheese with a little less guilt count me in!! 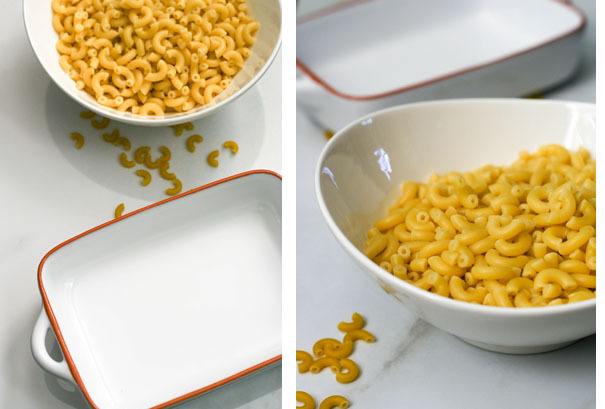 Mac and cheese is one of those recipes that everyone loves and of course can connect to (ahh food memories), but not one that everyone can always enjoy, so having a vegan and gluten free recipe in a great option to have! Thank you Meaghan, it is so true food memories. 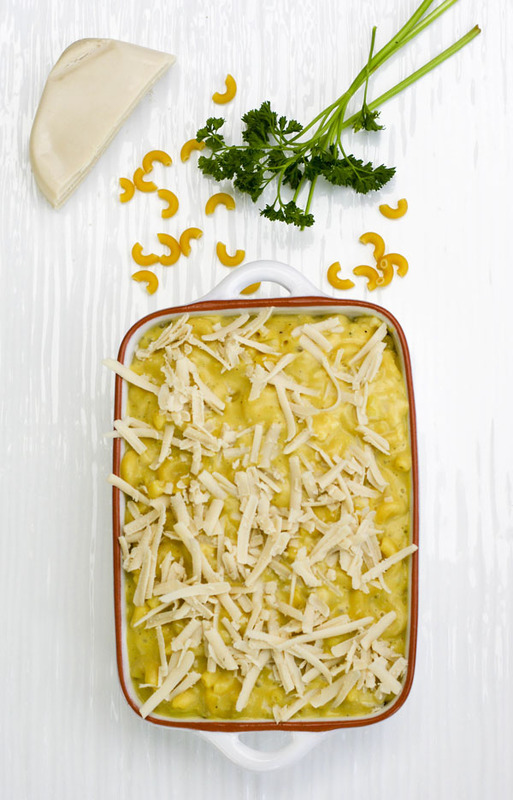 Mac and cheese is such a comfort and so many just love it so we thought why not make this for our friends who are gluten intolerant and vegan. I have to say that yease gives so much flavor to this pasta incredible. 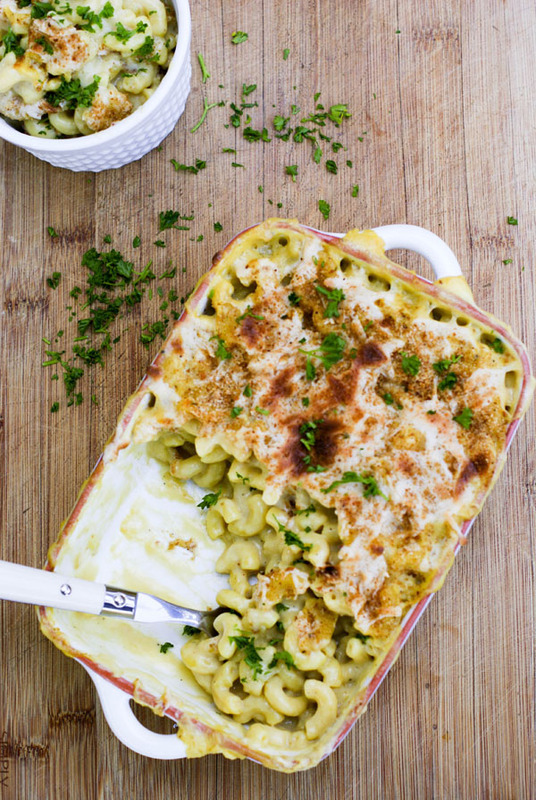 Brilliant idea to use nutritional yeast for that “cheesy” flavour! I don’t use it often enough, so thanks for the inspiration! Nutritional yeast is the next best thing to sliced bread. It has that oh so cheesy flavor and when combined with the right ingredients can achieve a rich creaminess that is lip smaking good! I am so glad to be introduced to this ingredient, and use it often. This is the kind of comfort food I’ll be needing in the gloomy days ahead. Pasta and potatoes have been my best friend lately. Awesome job, guys! I can almost taste it from here. Thank you NIcole. If anything can sooth your soul it is this Vegan Mac and cheese, full of passion to create it and wonderful ingredients to see it through! Its says comfort from the fist fork full in to the last bits at the bottom of the bowl. It even gets betyter a day after! 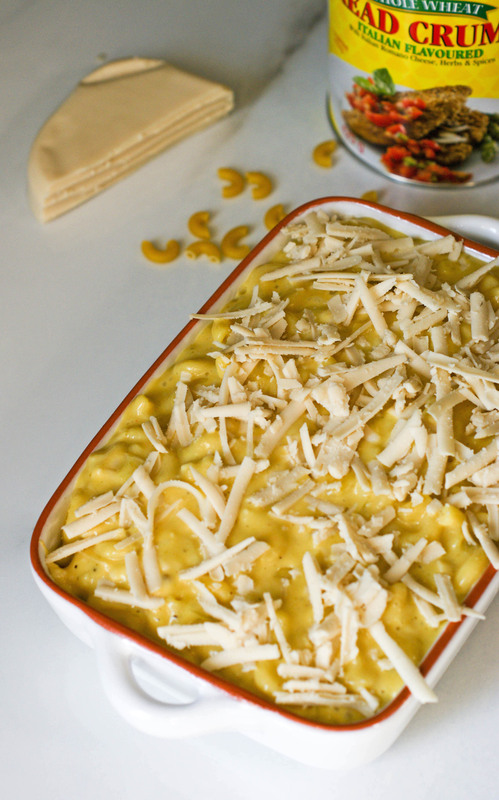 Being a homemade mac & cheese fan, I’ve always wondered if a vegan, cheese free version could be good. Now I see that it definitively can! Bookmarking to try. That would be a definate yes. For us we had our first try of vegan mac and cheese in Seattle in a market place, it was so good I was scrping the bottom of the plate to not let any go to waste. From then on it has been the search for the best vegan mac and cheese and this recipe is spectacular. Can’ waite for you to try it! Thanks for commenting and happy vegan mac and cheese making! Although I love a good quality cheese, I also experienced with nutritional yeast this year and was pleasantly surprised at how cheesy it tastes and makes a vegan dish stand out! This sounds delicious! Well done! Thank you Gabrielle, I am always amazed at the different ingredients used in vegan cooking. We are fortunate in Edmonton to have a few places that serve strictly veagan, and I am always impressed at how flavorful it is and how textures can be so spot on. This Mac and cheese is a tribute to all that inspiration I experienced and wanted to so share with everyone! Thank you for commenting, and have a great week! This looks and sounds delicious! I’m always impressed with how far vegan meals have come, and how many ways you can substitute dairy with things like cashews and such. I want to dive right into this! Hi Dana, I am so happy you enjoyed the Veagan Mac and Cheese. I think it is a real talent that veagan chefs have in using a variety of ingredients to achieve a most delicious dish, I am hoping one day that a friend of ours that owns a fabulous veagan restaurant will teach me his tricks, plus woulld love to xperience a comercial kitchen environment. It is so true what you said about wanting to dive right into this dish. When it comes out of the oven the aroma alone will inspire you to do so! Thank you for taking the time to comment, and Have a great start to the week!